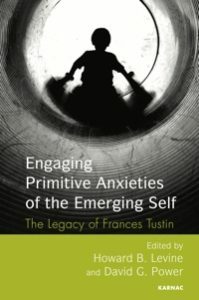 Engaging Primitive Anxieties of the Emerging Self: the Legacy of Frances Tustin (Karnac, 2017) is a a new book co-edited by Howard B. Levine and David G. Power. Frances Tustin was a pioneering child psychotherapist who broke new ground in working with autistic children in the latter half of the twentieth century. This book amplifies and extends contributions by Tustin to the study and treatment of autism, autistic spectrum disorders and autistic defenses and enclaves in non-autistic patients. It offers readers a contribution to the understanding and treatment of primitive mental states and primitive character disorders. Francis Tustin spent 1953-1954 in Boston working at the James Jackson Putnam Children Center, which had initiated research of “atypical” children in 1952. BPSI Archives holds the Center administrative records, reports, bulletins, photographs, and infant observation videos. David G. Power is a BPSI member and a founding member of the Boston Group for Psychoanalytic Studies and Past President, Supervisory and Teaching Analyst at the Massachusetts Institute for Psychoanalysis. He maintains a private practice in psychoanalysis, psychotherapy and supervision in Cambridge, Massachusetts.